According to the U.S. Department of Energy, 75% of homes have air conditioners and account for 6% of all electricity produced in the country. And all of that electricity costs homeowners around $29 billion annually, which is a huge chunk of change. 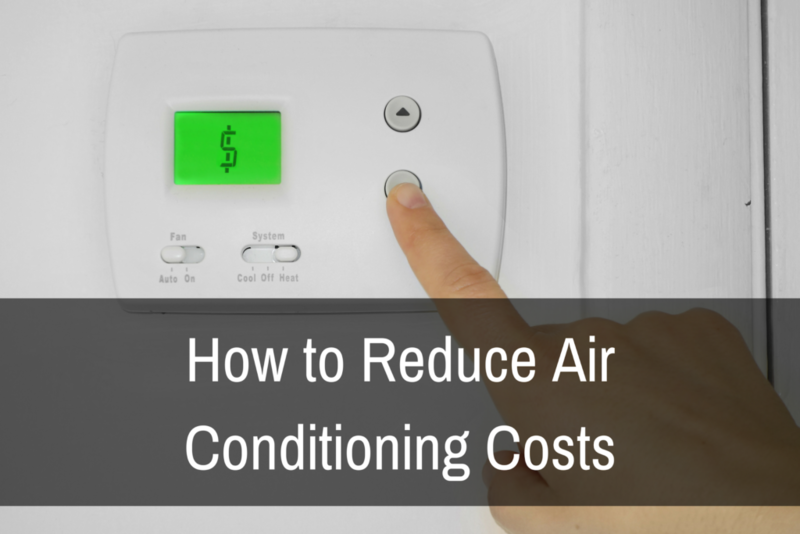 So how can you reduce, or eliminate, your reliance on costly central air conditioning? The secret to reducing air conditioning costs and electricity bills is all about optimizing your AC’s efficiency. The better your AC system is at cooling your home and retaining its temperature, the less your AC has to run and consume electricity. From purchasing the right air conditioning system to shading your home from the sun, there are several things you can do that will help your home stay cool and bills stay low all summer long. Having provided air conditioning services to thousands of homes over the last century, we have insider tips and tricks that can help you boost AC efficiency and reduce air conditioning costs. Below, we offer our suggestions to help make your air conditioner as green, efficient, and eco-friendly as possible. To help you cut down on your air conditioning costs, use the following tips to reduce your monthly utilities bill, while enjoying more efficient air conditioning. Bonus: these tips will also help you reduce your environmental footprint! This tip represents a cash outlay you may not like, but it will save you money, headaches, and energy in the long run. But if your air conditioner is over 10-15 years old, chances are that its efficiency is minimal at best. Because air conditioners are getting more efficient as time goes on, older AC units use up a lot more electricity than newer models. In fact, replacing your older AC with a high-efficiency air conditioner can reduce home cooling costs and energy usage by 20-50%. For central air conditioners, look for SEER ratings of 14 or higher. For window units, look for an EERE rating of 10.7 or better. When shopping for a new AC, it’s also a good idea to look for a model with a two-stage compressor. The compressor is considered the heart of your air conditioning unit. It works to compress hot vapors so that your refrigerant can become cool again before it enters into the condenser. As a result of all that effort, the compressor uses up high volumes of electricity. In order to ease the workload of the compressor, you can convert to a two-stage system that has a high setting for the hottest times of the summer and a low setting for milder days, thus saving energy. Air conditioners that are too large or small for the area they are meant to cool will run inefficiently, waste energy, and wear out more quickly than an AC that’s been properly sized for your home by an HVAC professional. In addition, air conditioners don’t dehumidify well if they are constantly turning on and off. Therefore, you want an air conditioner that is sized to run as consistently as possible. How can you tell if you have the right size unit? Have your local air conditioning professional perform a heat load calculation on your home to determine if you have the right size unit to keep your home cool. If your home doesn’t already have ductwork installed, central air can be an expensive investment. Because ductless air conditioners, also known as split systems, do not require ducts, they are a more affordable for older homes that were not built for central air conditioning. Plus, ductless systems allow you to individually regulate the temperature in rooms that you are occupying, reducing your cooling costs. These units can also incorporate heat pumps into the design in order to provide heat for your home. Ductwork that’s been poorly sealed can drastically reduce the cooling efficiency of your air conditioning system, as can ductwork that runs through uninsulated spaces like attics, garages, and crawl spaces. Double-check that your homes ducts are sealed and insulated to ensure that your home cools fast and retains its chill temperature. Multiple zone, programmable thermostats help reduce energy consumption by controlling how often your AC is turned on and off to maintain a consistent temperature. This can spell massive energy savings if you use that programming to your advantage. For example, you can program your thermostat to let the temperatures in your home rise while you’re at work. This will give your air conditioner a break and can save you as much as 30% on your utilities bills. Although most people have programmable thermostats, few use the program feature. This interactive guide from energystar.gov will show you how to program your thermostat if you don’t already know. And lastly, the higher you set your temperature, the more you’ll save. In fact, every degree higher you set your AC thermostat will reduce your home cooling costs by roughly 3%. Like your car, your air conditioner requires regular maintenance in order to run at peak efficiency. An annual cleaning and air conditioner maintenance visit will ensure that your air conditioner is operating at peak performance. During an annual maintenance visit, HVAC technicians will thoroughly clean and inspect your air conditioner to ensure that you are enjoying the most efficient air conditioning possible. Annual maintenance visits are also an opportunity to spot small problems before they develop into large, expensive problems. In this case, prevention will save you money. Dirt, dust, and debris can seriously impair the functionality and efficiency of your air conditioner, as your air conditioner works overtime to try to draw air through a filthy filter. That’s why annual cleaning and monthly air conditioning filter replacements are a must. Air filters should be replaced after every month of operation. If they aren’t regularly replaced, they will become choked with debris and dust, making it difficult to intake the air needed cool your house. Dirty air filters also block air flow to the condenser coil, which may result in your air conditioner leaking condensation or freezing up. Hot summer sunlight can really heat up a room, so keep your shades closed during the times of the day where the sun hits your house directly. If you work a 9-5 job, closing your curtains while you’re at work should do the trick. Also, shade east and west facing windows to reduce unwanted passive solar heat gain. Electric freezers, dryers, dishwashers, and ovens all pump heat into your home. Move them to the garage or basement (freezer and dryer), or use them during cooler periods of the day (dishwasher and oven) to avoid heating up your home unnecessarily. It’s also a good idea to avoid using your oven as your oven or stovetop can dramatically increase the temperature inside your home. On the really hot days, try grilling outside to avoid turning on your oven and heating up your home. However, if you must use your stovetop or oven, do so in the evening when the sun is no longer shining on your house and turn on the kitchen exhaust to draw the hot air out of the house. Some people think that turning their air conditioner off while they’re at work will save them money. However, if the temperature outside is warmer than 78 degrees, you’ll actually end up spending more money! This is because furniture and other objects in your home absorb heat on hot days when your air conditioner is off. These objects retain their heat longer than the air, which means that your air conditioner will have to work overtime to cool off these hot objects, even after the air in your home cools down. A better solution to turning off your air conditioner is to set it to a slightly higher temperature when you’re away from home. This will ensure that your home doesn’t get too hot while you’re out. You can save 5-15% on your air conditioning bills by raising the temperature setting on your thermostat when you’re away and don’t need cooling, according to the U.S. Department of Energy. The sun’s rays shining directly on your house are to blame for the excessive heat you feel inside your home in the summer. To keep those hot rays out and reduce the temperature inside your home, try planting trees on your property. The shade of the trees will keep your home cool, all while increasing your home’s property value and absorbing carbon dioxide from the air. It’s a win, win, win! Keeping your windows open while running your air conditioner is the antithesis of efficient air conditioning. The cool air generated by your air conditioner will escape through open doors and windows, so be sure to keep your house sealed while the air conditioner is running. If you want to open the windows for some fresh air, turn your air conditioner off first. Stagnant air tends to feel hot and humid, while moving air has a cooling effect on the human body. Give your air conditioner a boost by running fans in areas where you spend most of your time. Since cool air sinks, place fans on the ground and point them towards areas where you spend most of your time (e.g. the couch, your bed). The fans will direct cool air towards you and help circulate the cool air throughout your home. Humidity makes the air inside your home feel hot and uncomfortable. Avoid unwanted humidity by running your bathroom fan while you shower. This will draw humid air out of your home and help keep the bathroom cool. Integrating these 15 easy tips into your home can help you save up to 30% on your summer utilities bills and reduce your impact on the environment. From minimizing your oven usage to scheduling an annual air conditioning inspection, each tip on this list has huge saving potential. Is your home still not cooling to a comfortable temperature? Contact us to schedule an inspection. We will identify and solve the problem, as well as provide recommendations on how to keep your air conditioner functioning efficiently for years to come. For more helpful heating and cooling tips, subscribe to our blog and like us on Facebook!